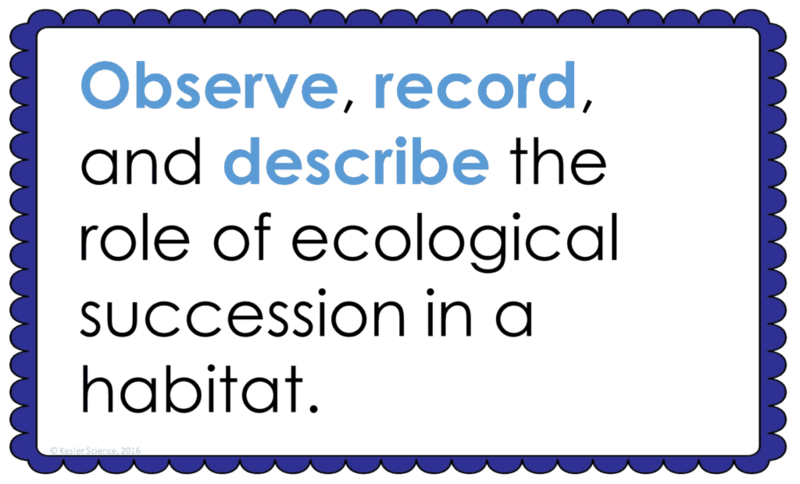 At the end of this comprehensive ecological succession lesson plan, students will be able to observe, record, and describe the role of ecological succession in a habitat. Each lesson is designed using the 5E method of instruction to ensure maximum comprehension by the students. The following post will walk you through each of the steps and activities from the succession lesson plan. The teacher will show students a slide of Mt. St. Helens using the provided PowerPoint. The teacher will ask students to share differences in the surrounding area since the eruption. The teacher will show a YouTube video using the provided link about the eruption of Mt. St. Helens. Students will be asked what changes have occurred since the eruption in 1980. 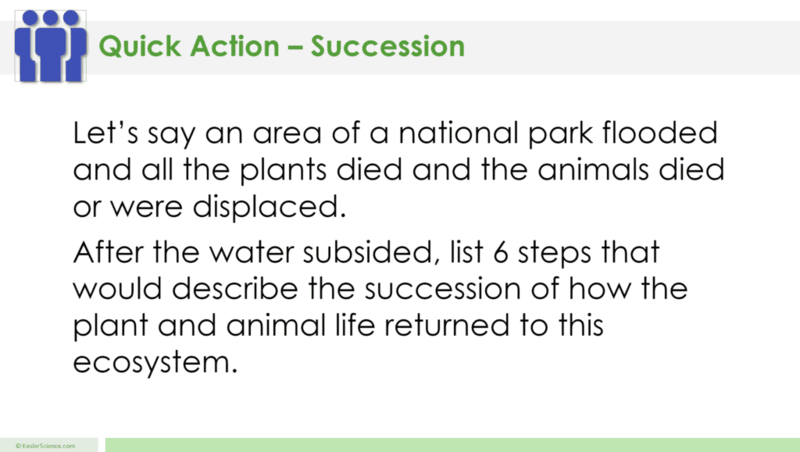 Let students know that this ecological process is called succession. The teacher will help to clear any misconceptions about succession. A major misconception is student’s don’t understand the reasons why ecosystems undergo changes. 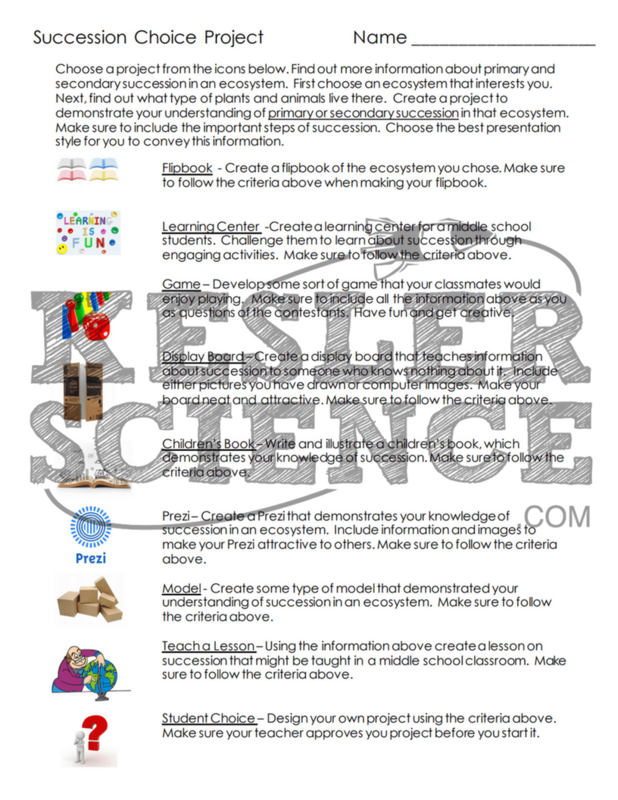 This student-centered station lab is set up so students can begin to explore succession. 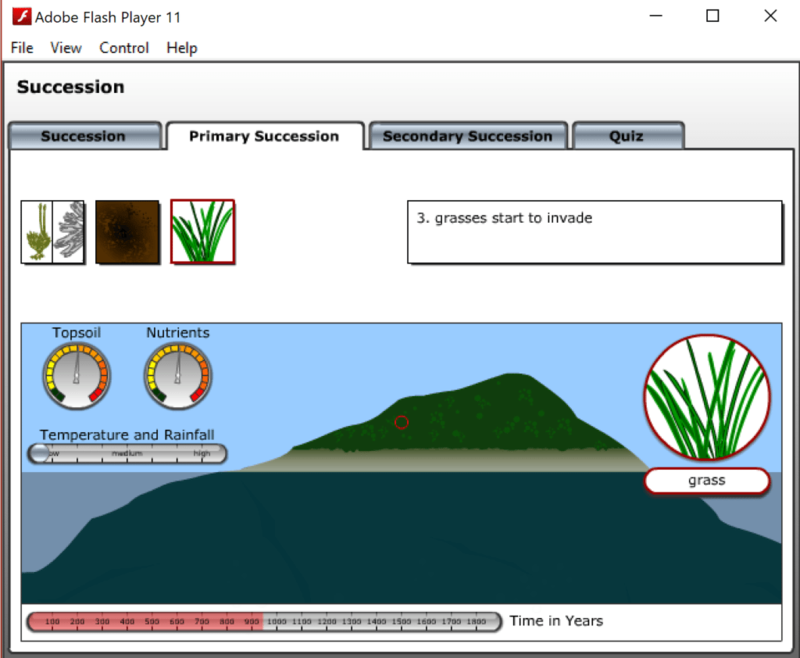 Four of the stations are considered input stations where students are learning new information about succession, and four of the stations are output stations where students will be demonstrating their mastery of the input stations. Each of the stations is differentiated to challenge students using a different learning style. You can read more about how I set up the station labs here. Students will be working in pairs to analyze succession. Students will analyze a set of cards and place them in order by stages of primary succession. 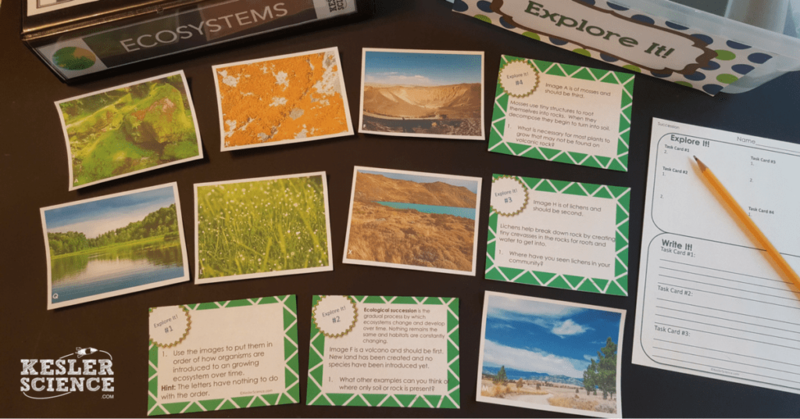 Each Explore It card will ask students to place cards in order and then answer a question based on the image on that card. At this station, students will be watching a six-minute video describing the stages of succession and how a forest area recovers after a disaster. Students will then answer questions related to the video and record their answers on their lab station sheet. 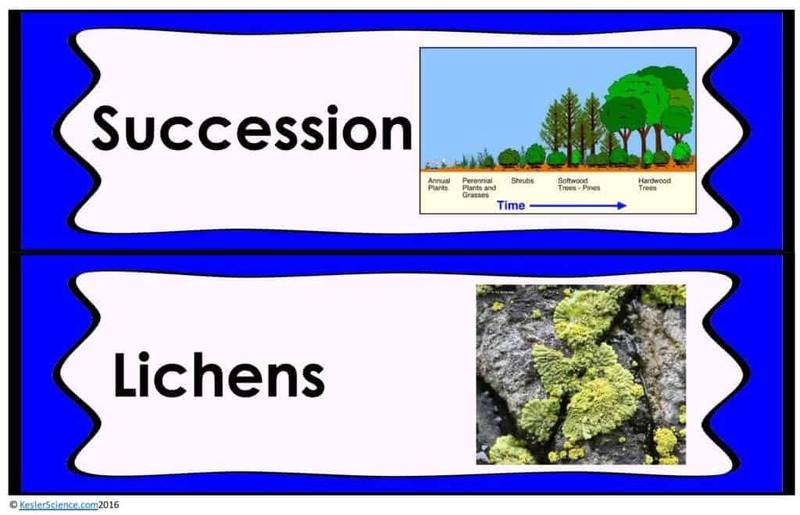 For example, what are some observations over the first 5 years of photos at the beginning of the video, describe the process of succession using the 6 steps from the video, and what is the difference between primary succession and secondary succession? The research station will allow students to explore an interactive website demonstrating primary and secondary succession. This station will provide students with a one page reading about lichen and mosses. In the reading, students will discover how these pioneer species are key to the breaking down of rock into soil. These organisms are responsible for the start of primary succession. There are 4 follow-up questions that the students will answer to show reading comprehension of the subject. The assess it station is where students will go to prove mastery over the concepts they learned in the lab. The questions are set up in a standardized format with multiple choice answers. Some questions include: After a forest fire, what pioneer species would move into the area first? What type of succession will occur if a parking lot is abandoned for 1000 years? What role do lichen and mosses play in succession? Finally, which event could begin the process of succession? Students who can answer open-ended questions about the lab truly understand the concepts that are being taught. At this station, the students will be answering three questions to explain why it is important to study ecological succession. They will explain, in their own words, what ecological succession is. Explain why primary ecological succession takes a lot longer than secondary succession. Finally, the students will imagine a raised garden bed that has not been taken care of for 5 years and then 100 years. What would the bed look like? Your visual students will love this station. 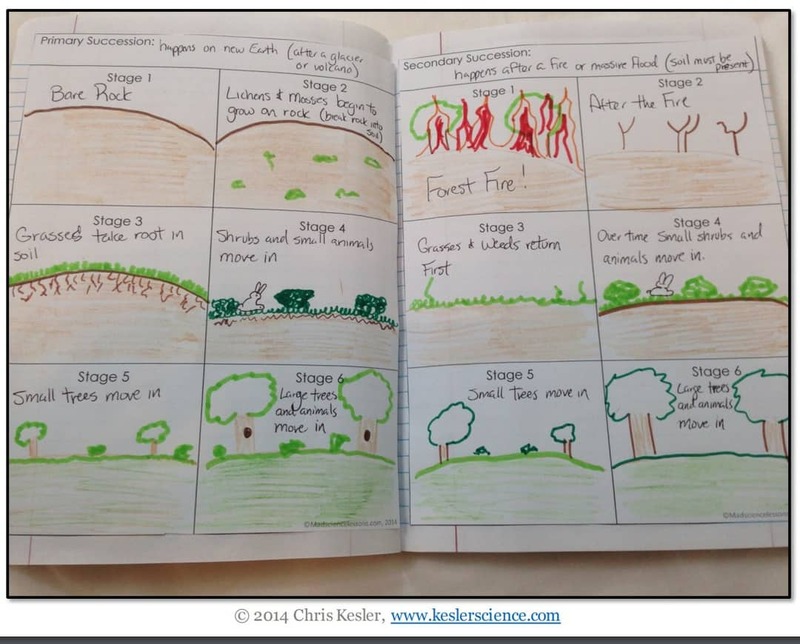 Students will draw images depicting both primary and secondary succession. Images will have labels on both diagrams. 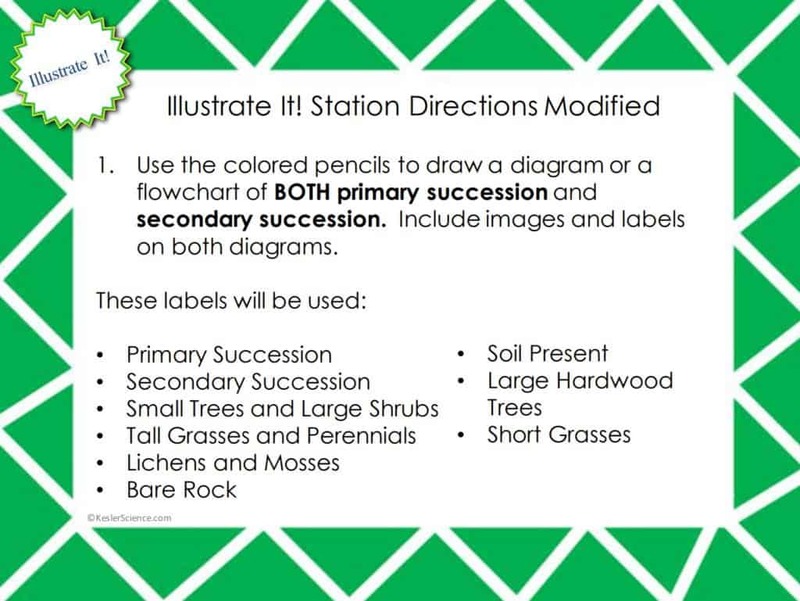 The organize it station allows your students to place cards describing primary and secondary succession into the 2 different columns. Each column is representing the type of succession that the card takes place in. The explanation activities will become much more engaging for the class once they have completed the exploration station lab. 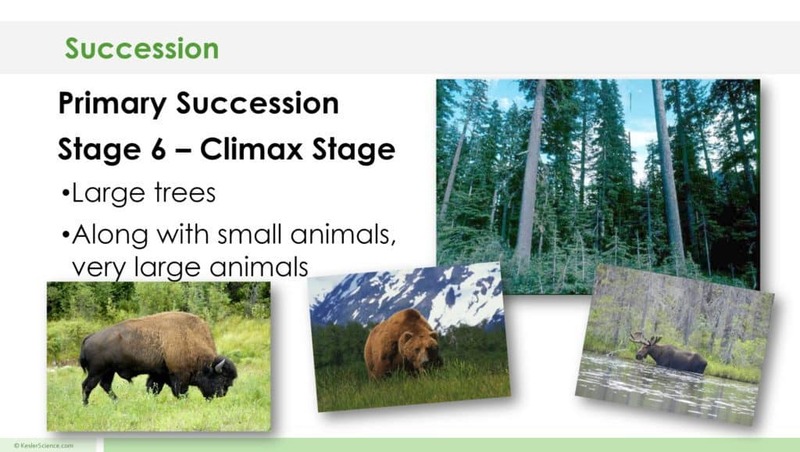 During the explanation piece, the teacher will be clearing up any misconceptions about succession with an interactive PowerPoint, anchor charts, and interactive notebook activities. The succession lesson includes a PowerPoint with activities scattered throughout to keep the students engaged.